It’s evident that commemorating Earth Day is a priority for Cherokee County residents. 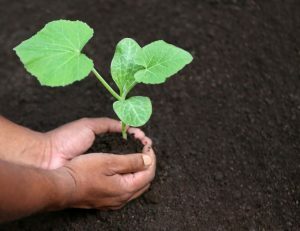 While April is especially busy with Earth Day on April 22, there are ongoing opportunities for recycling throughout the year. 9 a.m.-1 p.m. April 27 at Woodstock Elementary School, 230 Rope Mill Road. A celebration of Earth Day that includes recycling of electronics, cellphones and batteries, and document shredding. Visit www.woodstockga.gov for more details. 8 a.m.-noon first Saturday of each month at 151 Elizabeth St. The city of Canton’s Dumpster Days is a great opportunity for any Canton resident to dispose of trash, unwanted items, up to 10 tires per resident, and recycle many electronics free of charge. Please note: Dumpster Days are provided for Canton residents only. Please bring proof of residency when dropping items off. More details at www.cantonga.gov. Computers/laptops, gaming systems, VCR/DVD players, stereo equipment, vacuums, microwave/toasters, hair dryers, curling irons, tools, wires and cables (all types), phones (cellphones and home phone systems), printers/fax machines, washers/dryers, dishwashers and other home appliances (excluding refrigerators), sofas, mattresses and dry paint. CRT TV or monitor (old style tube TVs or computer monitor), refrigerators, fuel tanks, motor oil, fuel drums, household hazardous waste, antifreeze, wet paint, paint thinners, pesticides, pool chemicals or commercial waste. If you have any questions, please contact Code Compliance Manager Merrick McClure at 770-704-1554 or merrick.mcclure@cantonga.gov. Watch for details of the eighth annual Mayors’ Recycling Challenge that will kick off in Cherokee County in June. 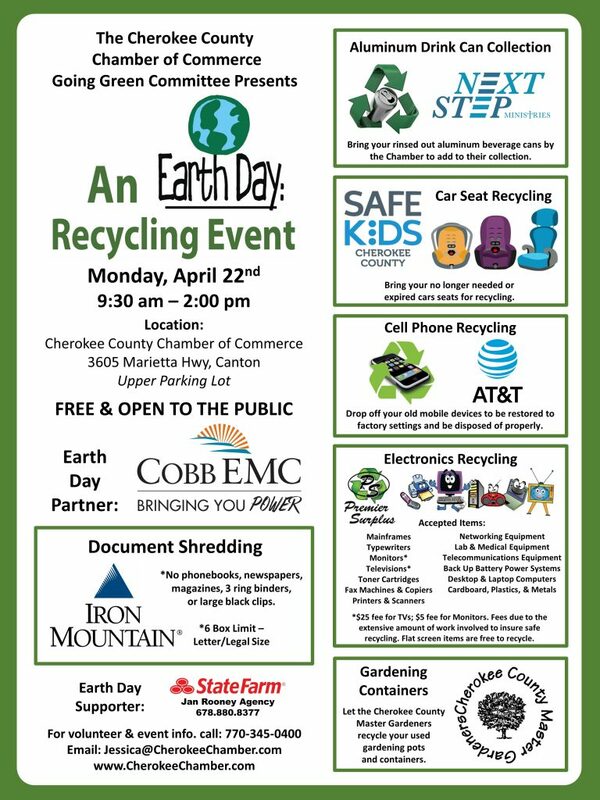 This Cherokee County Chamber of Commerce Going Green Committee initiative is aimed at sparking continued awareness surrounding community recycling while spurring a little friendly competition between the cities involved. During June and July, Cherokee County cities will be competing to see which can collect the most recycling. Awards will be given for most pounds of recycling collected overall, most improved city, and most pounds collected per capita. www.cherokeechamber.com. • BridgeMill Recycling, Bells Ferry Road, 770-591-0771. • Chadwicks, Highway 140, 770-475-9868. • Dixie, Highway 92, 770-924-6110. • Pine Bluff, East Cherokee Drive, 770-479-2936. The city of Canton operates a recycling facility at 2525 Ridge Road, free for city residents. Hours are: 7 a.m.-4 p.m. (closed 1-2 p.m. for lunch) Mondays, Tuesdays and Thursdays-Saturdays. Closed Wednesdays and Sundays.